This docking complex and warehouses also comprise the largest single collection of Grade I listed buildings anywhere in the UK. At the time of its construction the Albert Dock was considered a revolutionary docking system because ships were loaded and unloaded directly from/to the warehouses. Two years after it opened it was modified to feature the world’s first hydraulic cranes. Due to its open yet secure design, the dock became a popular store for valuable cargoes such as brandy, cotton, tea, silk, tobacco, ivory and sugar. However, despite the dock’s advanced design, the rapid development of shipping technology meant that within 50 years, larger, more open docks were required, although it remained a valuable store for cargo. 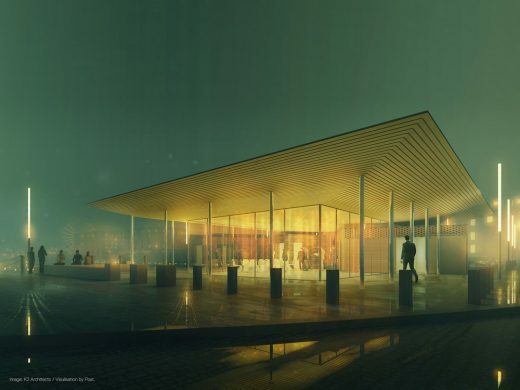 A planning application for a new Welcome Pavilion to be built at Albert Dock in Liverpool has been submitted to Liverpool City Council by Gower Street Estates, for a glass structure on Salthouse Quay.